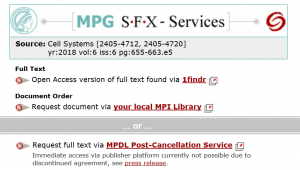 The Max Planck Digital Library has been mandated to discontinue their Elsevier subscription when the current agreement expires on December 31, 2018. Read more about the background in the full press release. Nevertheless, most journal articles published until that date will remain available, due to the rights stipulated in the MPG contracts to date. 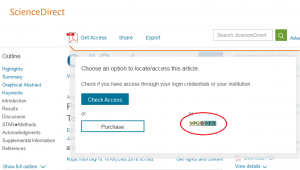 Step 1: Search in ScienceDirect, start in any other database or enter the article details into the MPG/SFX citation linker. Step 3: Check the options in the service menu presented to you, e.g. free available full text versions (if available). Step 4: To order the article via your local library or the MPDL, select the corresponding link, e.g. “Request document via your local library”. Please note that the wording might differ slightly according to your location. Step 5: Add your personal details to the order form in the next screen and submit your document request. The team in your local library or at the MPDL will get back to you as soon as possible. Please feel free to contact us if you face any problem or want to raise a question. As of next week, all http requests to the MPG/SFX link resolver will be redirected to a corresponding https request. The Max Planck Society electronic Book Index is scheduled to be switched to https only access the week after, starting on November 27, 2017. Regular web browser use of the above services should not be affected. Please thoroughly test any solutions that integrate these services via their web APIs. Please consider re-subscribing to MPG.eBooks RSS feeds. 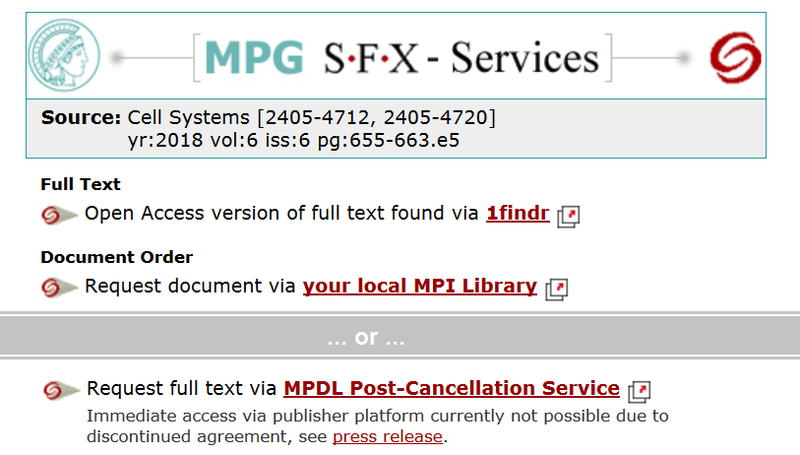 The MPG/SFX link resolver is now alternatively accessible via the https protocol. The secure base URL of the productive MPG/SFX instance is: https://sfx.mpg.de/sfx_local. HTTPS support enables secure third-party sites to load or to embed content from MPG/SFX without causing mixed content errors. Please feel free to update your applications or your links to the MPG/SFX server. The MPG/SFX server updates to a new database (MariaDB) on Wednesday morning. The downtime will begin at 8 am and is scheduled to last until 9 am. It has been 9 years since we introduced the DOI CookiePusher for the MPG/SFX server. 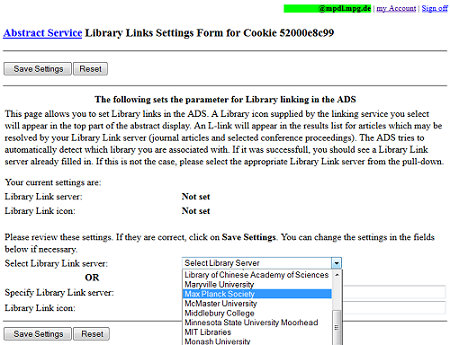 This functionality sets a cookie in the browser which will redirect DOI links to a local link resolver. As a result clicking a DOI link like doi:10.1016/j.biocon.2007.06.019 may lead you to a MPG/SFX service menu, instead of forwarding you to the publisher’s web site directly. Lately, we received quite a lot of feedback from users complaining about the extra clicks caused by this feature. Therefore, we decided to deactivate the DOI CookiePusher on MPG/SFX. It will take some days until all existing cookies have expired, but afterwards DOI links should no longer be hijacked by MPG/SFX. Please note that the cookie will expire after 72 hours, thus this needs to be repeated regularly. As always, your feedback is highly appreciated. Feel free to post your comment here or to contact us. Users of the SAO/NASA Astrophysics Data System (ADS) can configure their ADS preferences to link to the electronic resources available to them through their library subscriptions. The MPG/SFX server has recently be added to the list of Library Link servers offered by ADS. from the pull-down of available Library Link servers, select the entry for the "Max Planck Society"
Your ADS preferences are stored as a cookie in your browser and will remain active until you sign off the system. Using MPG/SFX with your favorite literature management tool? Due to a scheduled power outage vLib will be unavailable between Friday, 27/05/11, 8 p.m., and Saturday some time during the day. Please see the GWDG schedule (in German) for the most detailed information we found. As a high number of services will be experiencing a downtime, systems will be started successively. We have done our best to prioritize the start of vLib, however, we are unable to give any precise point of time when vLib will be available again after the outage. MPG/SFX services should be available without interruption. More info see GWDG News (in German see here). MPG/SFX was scheduled to be recovered in the course of the weekend, hence we cannot guarantee that the MPG/SFX server will resume normal operation before Monday. Please see GWDG News for updates. We sincerely regret the prolonged downtime. Unfortunately, MPG/SFX is unavailable this morning, see GWDG News for more information. In this blog you'll find updates on information resources, vendor platform and access systems provided by the Max Planck Digital Library. Use MPG.ReNa to search and browse through the journal collections, eBook collections and databases available to MPG researchers.